it gently up over you on to other things? which remains motionless when your depths resound. drawing out from two strings but one voice. On which instrument are we strung? And which violinist holds us in his hand? Thanks to Cliff Crego for the translation on http://picture-poems.com/rilke/index.html. nicht weiterschwingt, wenn diene Tiefen schwingen. die aus zwei Saiten eine Stimme zieht. See also Ahead of all parting: The selected poetry and prose of Rainer Maria Rilke, Stephen Mitchell ed. and trans., Modern Library, 1995, 615 pgs. Tonight, Assembly Republicans jeopardized extended unemployment benefits for struggling Wisconsin families after voting to pay private partisan attorneys $395 an hour in taxpayer money to gerrymander legislative districts behind closed doors. When will it stop? Aileen O’Bryan. The Dîné: Origin Myths of the Navaho Indians. Bureau of American Ethnology, Bulletin 163. 1956. Book plate: Withdrawn, [portrait of Collis Huntington], Huntington Free Library and Reading Room [Bronx]. Museum of the American Indian, Heye Foundation. 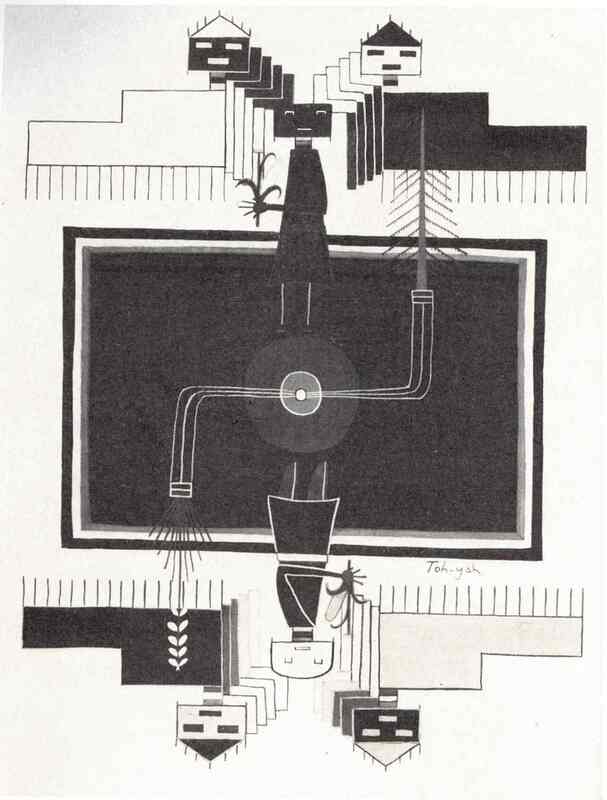 Frontis by Gerald Nailor, “First Man, pine tree and white corn; First Woman, yucca and yellow corn.” Wouldn’t you like to see this in color! How did this book end up for sale on Amazon.com? Collis Huntington founded the library in 1892; his adopted son Archer added the Museum and Heye Foundation in 1930. The Library gave the Museum’s collection of artifacts to the Smithsonian in 1990. In 2004, after several years of legal wrangling, the library of the Museum and Foundation went to Cornell University. Dispite the small-minded law suits, the Smithsonian hasn’t been particularly bookish for decades. In March 2011, the modest library in the Museum’s Washington, D.C., Reading Room was disbanded. The Smithsonian’s Museum of the American Indian still doesn’t have a on-line catalogue of books. We’re friends of the Norton Simon Museum. For less than $50 a year, we can walk in any day to look at a single painting or check their latest exhibit. It’s like we own the place and are kind enough to let everyone else come too. You can’t loose as a museum member. 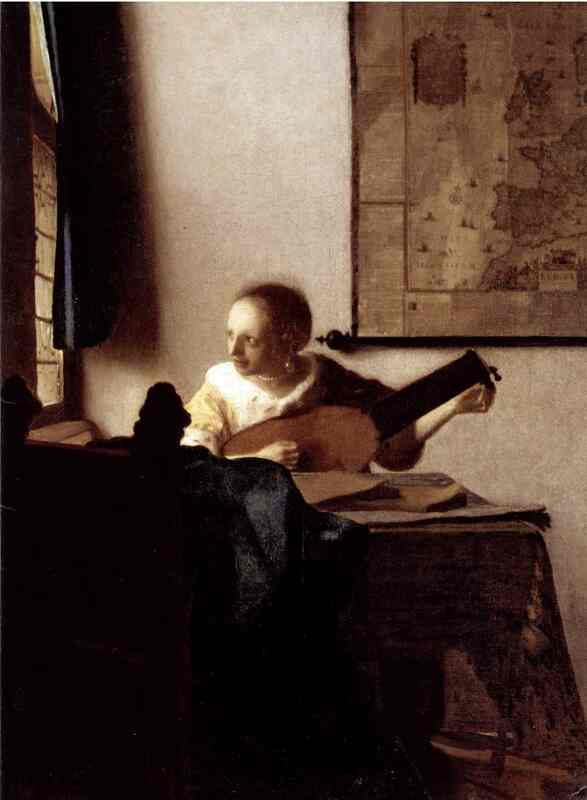 Vermeer’s Woman with a Lute is on loan from the Met. It’s not the best Vermeer, but since we’re members, we could wander in, look at it, talk about it a bit, and leave. For free. I’m not yet very good at figuring out how to do this correctly–now the Buffalo sign photo is up there, but I can’t seem to write anything about it along with the photo post. 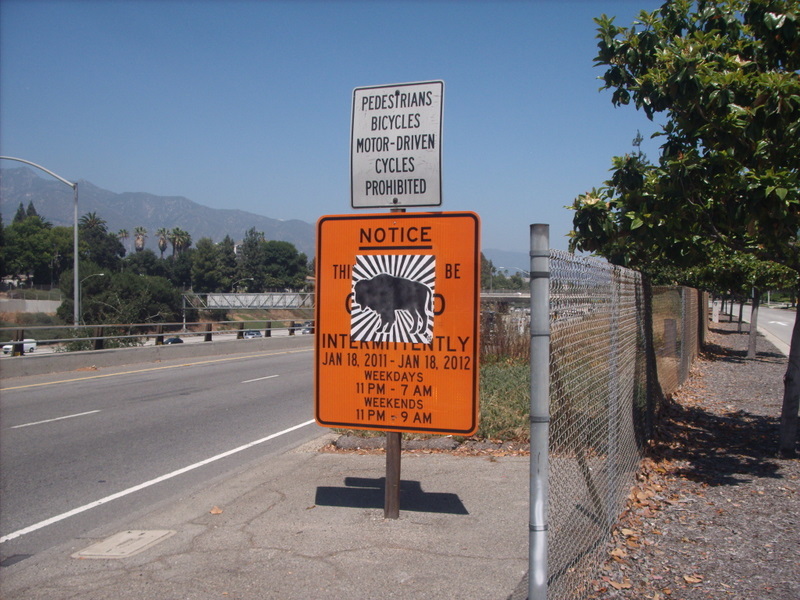 ANYWAY: we saw this great stencilled buffalo with black and white rays, signed “CC”, on the temporary sign leading onto the 210 freeway at Marengo Ave. in Pasadena. I wonder how long it’s been there, and who did it? A Native American group? The accepted date for Arbogast’s arrival in Alsace is 550. His bishopric was preceded by a sojourn in the forest of Hagenau. 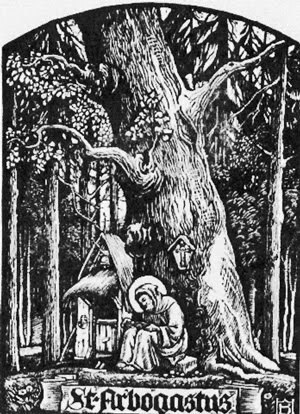 This dense oakland, the haunt of anchorites, was called the Sacred Grove of Northern Alsace. Within it Arbogast had his cell. An oak tree of huge dimensions marks the spot. Indicative are the hamlets Saint-Arbogast and Chene (=oaktree) on the road from Strassburg to Weissenburg/Wissembourg.